An extract from Michael A. Conway’s review of Achill: The Island in The Furrow. There is an intimate connection between poetry and origins. Poetry has the capacity, for instance, to put language into a state of alert, where something unknown, unthought-of, or original might erupt in consciousness. The same can be said of painting, where it is the image that becomes the vehicle of vision and insight. This is eminently illustrated by this wonderful collection of poems from John F. Deane and of paintings from John Behan. Their collaboration is an exploration of Achill Island, Co. Mayo: its landscape, its people, its past and its possible destiny. The media of poem and paint suggest a world at once domestic and wild, light and dark, visible and invisible, profane and sacred. 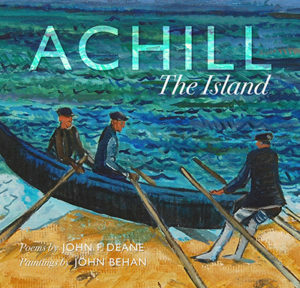 The poems are all linked in a personal way to the island in that it is Deane’s place of birth and formative years; while the sculptor and painter John Behan, for his part, has spent time on the island in the Heinrich Böll Cottage, and much more of his work is related to island life. To visit the place, time, and language of childhood is inevitably to raise fundamental questions about origin(s), ancestors, and belonging; and by extension the equally primordial questions of depature, death, and destiny. Although reserved to the beginning and to the end, these questions accompany us all the time, but most usually outside of or tangential to ordinary day-to-day consciousness; that is, until some event, or person, or phone call jolts us into more complete awareness. I know of no other poetry collection that does this so resolutely. Almost all of the poems hover on the edge of the phenomenal order between the known and the sensed, the sure and the uncertain, the mundane and the mysterious. From the ‘beginning’ Deane connects the ‘landscape, sea-scape and sky-scape’ of the Achill of his formative years to the ‘wonders of the Christian faith’; and on this basis a sacramental awareness is a striking feature of many of the poems. The elements of island (landmarks, flora, etc.) take on a symbolic charge so as to lead us into a mythic, if not mystic, space. Many of the poems work as epiphanies (in Joyce’s sense), permitting what might appear first as a marginal awareness to emerge in its full splendour, proffering insight, vision, and hope. The paintings that accompany the poetry are striking in image, colour, and technique. They capture island moments (in acrylic on board, paper, or canvas), be they currachs on the beach, fishermen carrying home the catch, the magnificent beaches of the island, or bringing the dead to their final resting place. The palette of colour and the brush stroke communicate a desire to plumb the depths of that moment, when landscape, person(s), life, and death rhyme in and out of season. Many of the paintings are suspended between a literal realism and a vibrant abstraction, where colour and contrast convey the enchantment of the island, its landscape, its people, its mountains, its skies, and its horizons. The extraordinary rendering of the sea captures the luminescence of light on water as a backdrop to the powerful presence of the fisherman, whose hands and face have been darkened by the weathering of island life. This collection of poems is dominated by a foundational intuition that the natural order and the human habitat is a place of oblique revelation that might well open to the Christian horizon on life, death, and hope. A distinctive poetic voice emerges clearly throughout the poems, which in its very particularity strikes a universal chord, and means that, although they speak to situations that are native to Achill, these poems might equally appertain to any place of human habitation. This is an extraordinary collection in its intensity, sensibility, elegance of expression, and sheer insight; much of it is faith informed or religious (if that word does not overstate). Deane transposes into the poetic voice a possibility of (re-) considering Christian faith in our post-modern, deeply fractured culture (at least, when it comes to all things transcendent). In this, he penetrates far deeper than the all too common language of ‘spirituality’ that in saying so little, speaks to so many. On a minor critical note, I would have liked to know the size of the paintings (it is difficult to imagine the originals without a scale measure). This is a stunning collection of poems and paintings to be savoured time and again. 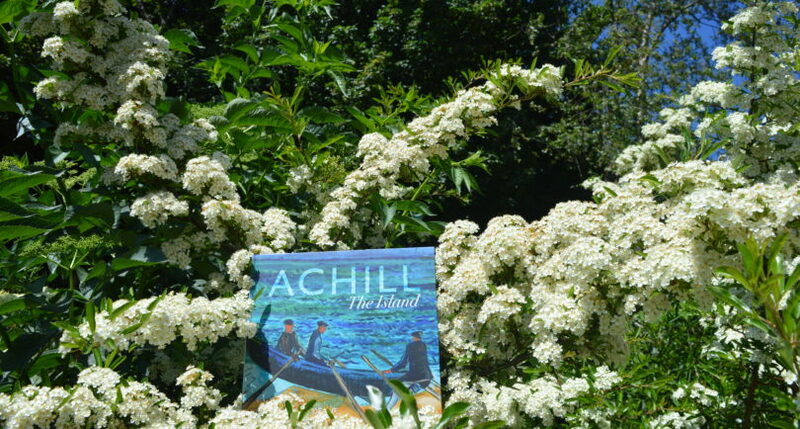 To get your own copy of Achill: The Island you can click here.